For more information about any of our School and Educator Programs, contact Jennifer Infinger, School and Family Programs Manager at jinfinger@harn.ufl.edu or 352.294.7060. 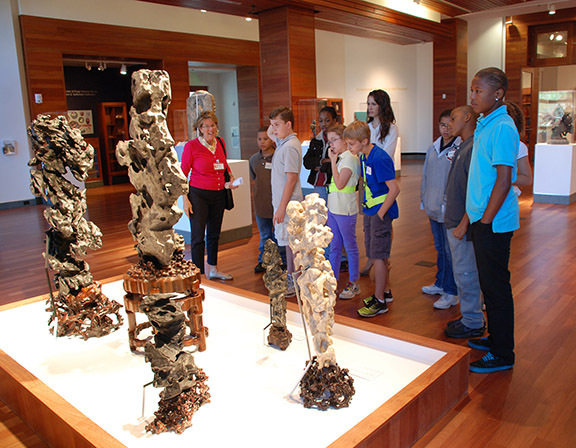 The Harn offers docent-led tours with a discussion and inquiry-based learning approach for students in all grade levels and subject areas. Choose from one of the School Tour Programs listed below or customize your visit to directly relate to themes and topics being explored in your classroom. A maximum of 60 students may be accommodated for each tour, and guided school groups may tour the museum Tuesday-Friday 10 am to 3 pm. A minimum of three weeks advance registration is required. Questions? Contact tours@harn.ufl.edu. Suggested grade level: K-12 • Program Length: 1 hour • Choose one of these special themes or simply request “highlights of the museum." What is an Art Museum? 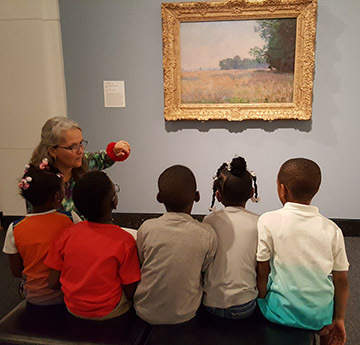 (Suggested grade level: 2-5) Students will engage with museum objects, museum staff and the physical museum site to develop and inform their understanding of how an art museum works. The Natural World Reflected in Art. (Suggested grade level: K-12) Students will encounter artwork inspired by or created in response to the natural world, investigating the connection between artist and environment. Living in Diverse Worlds. (Suggested grade level: 4-12) Students will explore artwork from various countries and cultural traditions, expanding their concept of self in the context of their community and beyond. Classroom subject theme -- Teachers may request custom themes to connect directly with class curriculum. Students analyze and respond to artwork through individual, partnered and team activities in the galleries. Guided by a docent-educator, students participate in three discussion-based quests that strengthen visual literacy skills, deepen personal connections and inspire creativity. Research has shown that looking at and talking about art increases empathy, an important skill for lifelong growth and development in a multi-cultural world. Student reflections about art and conversations with each other are at the core of this program. Students choose one artwork in response to a question. Following individual time reflecting, studying, and writing about their selected objects, students join together to share their ideas with each other during an educator-led tour that includes all selected artwork. Reflection questions are designed by museum staff and focus on empathy-building, self-reflection and multi-cultural awareness. *Note that this program is only available Tuesday - Friday, 11 am – 2 pm. 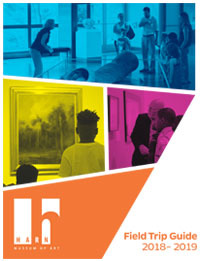 The Harn offers educator workshops each fall, spring and summer. Information about upcoming workshops is located on our K-12 Educators page. Downloadable images, information and lesson guides for K-12 teachers are available for a number of objects in the Harn’s collection. Use these resources to prepare students in advance of a field trip or to integrate cross-curriculum teaching opportunities. Resources are available on our K-12 Educators page. Home school groups are welcome at the Harn. See the School Tours section for more information about scheduling a group tour that can be customized to meet your learning goals. Early Learning at the Harn is a school and museum-based program for pre-K and kindergarten children to promote visual literacy, vocabulary development and individual expression, especially for children of low-income families who face an educational achievement gap.